Acid in Food– Acid in food is a big culprit in tooth erosion, especially when the teeth are brushed directly after eating the acidic food. While some acidic foods are easy to recognize by the sour taste they have, others are not. Carbonated beverages are a prime example of acidic foods that aren’t easily recognized as acidic. This doesn’t just refer to Coke and similar sugary soft drinks, even plain seltzer is acidic. Coffee is another example of an acidic beverage that may not obviously be acidic. Stomach Acid– The stomach is full of very strong acid that helps digest food, but in the mouth this acid can be harmful to teeth. Stomach acid reaches the mouth during episodes of heartburn or in cases of bulimia. Bacterial Acid– The mouth is full of bacteria, some harmful, some good. There are certain bacteria in the mouth that eat any food debris that left in your mouth. As a byproduct, the bacteria produce acid. This problem is specific to carbohydrates. The more carbohydrates in the food and the harder the food is to clear from the mouth, the more likely it is that bacterial acid will erode your teeth. Luckily there are steps that can be taken in order to prevent tooth erosion. You don’t need to stop drinking coffee or give up all carbohydrates in order stop cavities. 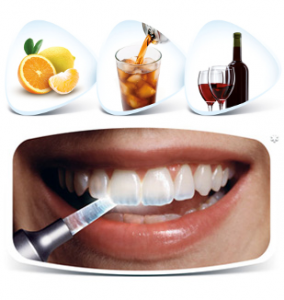 There ways to manage and fight tooth erosion. Remineralization– Remineralization fights dental erosion by adding to the mineral layer that makes up the tooth. Drinking fluoridated water, getting fluoride treatments, chewing sugar free gum after meals and eating enough calcium can help in the remineralization process. Remineralization is a problem for people with dry mouths, however, since the minerals that make up the teeth are carried and deposited by the saliva. This is why people with dry mouth tend to have more cavities, since their teeth are not reinforced with remineralization. Proper Brushing– This doesn’t just mean keeping your teeth clean of food debris. It also means not brushing too soon after eating acidic food or after heartburn. For a better tooth cleaning you may want to consider getting an electric toothbrush. Antibacterial Treatment– You can also reduce the number of bacteria in your mouth (good and bad) by brushing with toothpaste and rinsing with antibacterial mouthwash. You can also add oil pulling to your routine as it has shown to reduce the acidity in the mouth as well as the number of cavity causing bacteria.